The “population question”, central to the debate about humankind’s future since the 18th century, has slipped away from center stage and fallen into a coma in recent years. The international community is busy promoting the 17 Sustainable Development Goals (SDGs) with their attendant 169 targets, and appears convinced that population has ceased to be a threat for balanced development. There is a sort of consensus among demographers that the world’s population will converge to a quasi-stationary state by the beginning of next century and this conviction has dispelled the severe anxiety about the future that affected most population experts in the second part of last century. Fortunately three articles recently published in N-IUSSP, by David Lam, Richard Grossman, and George Martine (2018) have reopened the debate. Lam (2017) opines that “an important source of optimism about the world’s ability to support an additional 4 billion people is the success in supporting the previous 4 billion”. Grossman (2017) refutes Lam’s optimism: “My concern” he writes “is that the past 4 billion have degraded the natural world upon which we depend, and that this degradation will make the world much less welcoming to the next 4 billion”. Martine (2018) is much more pessimistic: “Given the trajectory of degradation caused by the richest third of the global population, the planet we know could well be thrashed even without the addition of a single baby.” This is a classic example of pessimism-optimism dualism between contenders: the facts are not in dispute, and the authors accept the validity of the UN projections. 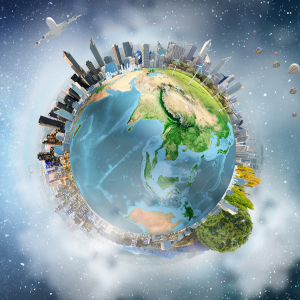 Population interacts with the external constraints such as space, land, water, air, non-renewable resources and energy. Humankind, throughout its history on this planet, has found these resources in almost unlimited supply. But things have changed rapidly in recent times and some natural resources – particularly air, land and water – are under stress because of rapid population growth. During an exceptional twentieth century, the world population increased fourfold (from 1.6 to 6.1 billion); during the current century it will fall short of doubling (11.2 billion in the year 2100, UN 2017, medium variant projection), and will approach zero growth towards the end of this period. At the time of writing, 30 per cent of the total increase projected for the 21st century has already been achieved (by the end of 2017 the population has reached 7.6 billion, 1.5 billion more than in 2000, out of a total forecast increase of 5.1 billion for the entire century). Since population change is a complex process, the question to be discussed is whether this change is compatible with smooth and balanced development. In short, is sustainability threatened by the current and foreseen demographic trends? My thesis is that there are several aspects of current trends that may compromise development and its sustainability, the political order, and the relations between countries (Livi Bacci 2017). However, these negative aspects can be attenuated, if not resolved, through appropriate policies implemented by governments with the support of the international community. Of the several threats to sustainability, I will briefly comment on two: the environmental consequences of the struggle against poverty and backwardness, and the increasing anthropization of land. There is a consensus in the international scientific community that global warming is primarily “anthropogenic”, or due to the increase in human activities. More and wealthier people mean more production and consumption, more emissions, stronger greenhouse effects, warmer climate. With more technology, it is possible to lower the quantity of energy and non-renewable materials required for every additional unit produced or consumed. However, this will be easier to achieve in wealthy societies where the dematerialization of consumption is possible (an additional dollar may be spent on buying an e-book, enjoying a concert, purchasing personal services). Much less so in poor countries, where an additional dollar is spent on buying oil for heating, cooking, and transportation; metal tools for work; food for nutrition; shoes for walking; and other basic commodities for which dematerialization is impossible or minimal (Livi Bacci 2015). 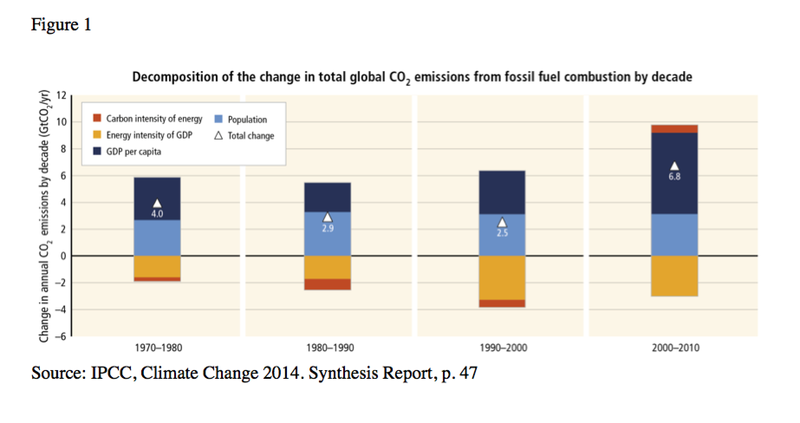 Figure 1 shows the decomposition of the change in total CO2 emissions from fossil fuel combustion, by decade, between 1970 and 2010. 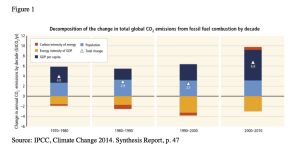 The role of population growth in the change in global emissions is more or less equivalent to that of GDP per capita growth in the 1970s and 1990s; it is larger in the 1980s and smaller in the first ten years of our century. The counteracting impact of technology (i.e., less energy intensity for every GDP unit) is more or less equivalent, in the last two decades, to that of population. It is obvious that population growth will be responsible for a fair share of future greenhouse gas emissions. Slower growth means fewer emissions. Total fertility in sub-Saharan Africa is at present around 5 children per woman and, according to the UN, it will be 3.1 in 2050 (medium variant). If, with adequate policies, it could decline to 2.6 (low variant), the population in 2050 would be 1.96 billion instead of 2.17, lowering significantly the increase in emissions. Reducing the speed of population growth would have beneficial effects of the same order of magnitude as those produced by technological progress. An expanding population requires more land and space in a finite world. As population grows, the available space declines, and anthropization of land increases. With 13 per cent of the earth’s land surface occupied by arable land, 26 per cent by permanent pastures, 8 per cent by managed forests, 3 per cent by urban areas and 4 per cent by infrastructures and economic activities, 54 per cent of all land is now directly or indirectly affected by human activities. Of the remaining 46 per cent of (relatively) pristine land, much is inhabitable because located in permafrost, desert or high mountainous areas (Hooke and Martin-Duque 2012). Three aspects are worth considering with attention. The first is the human intrusion in the great forests, and particularly into the rainforests, whose integrity is a guarantee of the bionatural equilibrium. The second is the intensification of human settlement in the most precarious habitats, particularly along the coasts and along the shores of river and lakes. The third is the explosion of the urbanization process. Deforestation has affected the major river basins in America, Africa and Asia. In Brazilian “classic” Amazonia (3.6 million km2), the deforested area rose from 2 per cent in 1980 to 12 per cent in 2010, while in this period the population increased 2.5 times (from 5.9 to 14.8 million) due to rapid immigration. Immigration, deforestation for residential space, infrastructures, cultivation, pasture, and mining are processes closely linked to population growth. Rainforests play a crucial role in maintaining environmental balances, moderating greenhouse emissions and thus global warming, maintaining the integrity of water reserves, and protecting biodiversity. The fundamental problem for the governance of rainforests is that the trees are more valuable when they are cut down than when they are standing and that pasture and arable land have more value than virgin forests. Strict regulatory actions are therefore needed. Population density and population growth, almost everywhere in the world, are higher in coastal than in inland areas, with the former being in general more valuable, attractive and functional (historically, major cities developed along the coastline or on the banks of the major waterways). These areas attract commercial and industrial activities and immigration flows, they need infrastructures, they stimulate urbanization. However, several of these areas, particularly low-lying coastal areas, are also fragile and vulnerable (just think of the more than 200,000 victims caused by the 2004 tsunami in South East Asia), and the more so as global warming raises the sea level. “Of the 1,692 cities with at least 300,000 inhabitants in 2014, 944 (56 per cent) were at high risk of exposure to at least one of six types of natural disaster (cyclones, floods, droughts, earthquakes, landslides and volcanic eruptions), based on evidence on the occurrence of natural disasters over the late twentieth century. Taken together, cities facing high risk of exposure to a natural disaster were home to 1.4 billion people in 2014” (UN 2016). In 1950 there were only two so-called “megacities” or agglomerations of over 10 million inhabitants, and in 2016 they numbered 31, of which 24 in less developed countries. The modern mega-urbanization process has been compressed into a very short time, in a disorderly and often anarchic way. Its negative consequences include the degradation of space, air pollution and water contamination, with effects that spread out into the ecosystem and well beyond the megacity’s own territory. As the growth of the big conurbations is faster than the growth of the urban population, the negative effect on the ecosystem appears destined to increase. Yes, Malthus again. The world has fixed limits: there are probably no limits for the production of subsistence, as Malthus thought. But land, space, air and water have limits; they are resources that have to be managed. Management means governance, particularly at the international level. And the world would be probably better off if, by the year 2100, its population stood at 10 instead of 11 billion. Livi Bacci M. (2015) Pauperia and Tycoonia: population and sustainability, N-IUSSP, July 14. Livi Bacci M. (2017) Our Shrinking Planet, Polity Press, Cambridge. UN (2016) United Nations, Department of Economic and Social Affairs, Population Division, The World’s Cities in 2016. Data Booklet. UN (2017) United Nations, Department of Economic and Social Affairs, Population Division, World Population Prospects 2017.